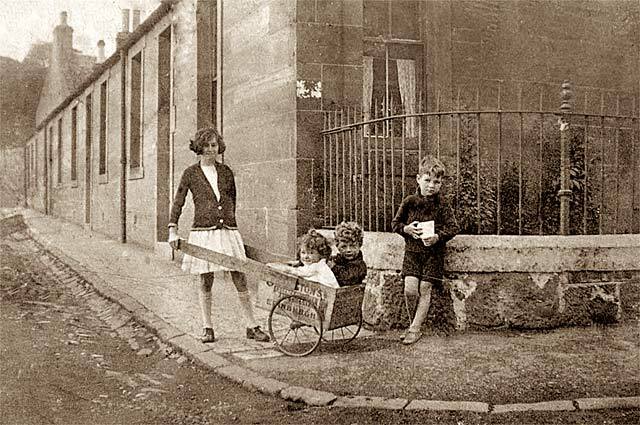 Photo of a barrow box and 4 children, taken around 1933. Where might this photo have been taken? Thank you to David Bain for sending me this 'mystery photo. "Here's another "Where is it?" photograph to tempt the armchair detectives. All I can say is it was taken in about 1933. I'm sure the boy on the right is my dad, Tom. He looks to be nine or ten. I think the other children are cousins, possibly the children of his Uncle Adam. If you can help to answer this question, please email me, then I'll pass on your message to David. thank you. "I can’t help on where David Bain’s photo might have been taken. However, I do remember that there was a Symington’s factory in Logie Green Road in the late 1940s. It made coffee. It was directly opposite our house and next to the entrance to the Powderhall greyhound racing track." it reminded me of Westland Cottages on the corner of Ravenscroft Street and Ravenscroft Place, Gilmerton." Has anyone got an up to date photograph for comparison?" Jimmy Cunningham is correct. I visited Westland Cottages on the corner of Ravenscroft Street and Ravenscroft Place at Gilmerton this afternoon and took a few photos of the cottages. Please click on the thumbnail images below to see the old and recent photos together. There is no doubt that both photos are of the same street! Thank you to Jimmy White for confirming the location of this photo, and for telling me more about this area. "I'm almost sure that this photo is of the cottages right opposite the entrance to Adams' farm. This farm entrance leads to the 'middle strip' ." "The cottages are still there, but the big house at the back of these cottages has long since been knocked down. At the back of this big house there was a field with another big house in it. This is where Bob Ritchie stayed. He owned 'Jock the horse'. This is now Gilmerton Place, part of the housing estate." "The road straight ahead in this photo was a dead end, with only the entrance to the big house at the end. These rows of cottages were built in an 'L' shape, with the horizontal part of the 'L' , that you can see in the picture, leading to the big house. The vertical part of the 'L' shape was the end of Main Street, when turning the corner towards New Street. I remember Hugh Innes, the coal merchant living in the last cottage. (You can't see it in the picture.) Next to this was a market garden." "In my days there was a corner shop, right opposite this photo. Looking down Main Street, was Runciman's shop. - cottages and a church.